It was in 1898, that the amazing Lamp Berger story started. In response to a major preoccupation at that time - a sepsis in hospitals - Maurice Berger, a pharmaceutical dispenser, invented a system of diffusion by catalysis, for which he filed a patent. This revolutionary technology, which purifies the air in enclosed rooms, was soon to be applied for private use, giving birth to the Lampe Berger company. As beautiful as it is useful for exhaling a cleaner and more fragrant air, the Lampe Berger is available in an incredible variety of styles, designs and materials in order to meet every individual's desires. The collection today is made up of around a hundred wonderful lamps. Lampe Berger perfectly captures all these moments of our lives to form a symphony of aromas. Warm notes, fresh flora, sublime sparkle, exotic scents, and enlivening, amber tones. 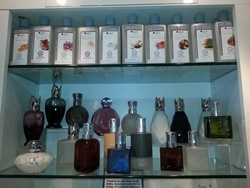 The Lampe Berger fragrance range is as wide as your imagination takes you.